Four mothers and their daughters participated in "Across Generations," donating blood and urine for the study in November and December 2005. Currently living in New York, Colorado, Washington DC, and California, these women range in age from 17 to 62. On average, more than 90 percent of the chemicals found in the daughters were also found in their mothers. 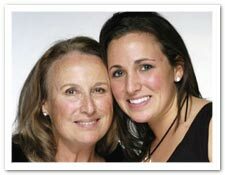 These mothers and daughters, and the common ground they find in their body burden of chemicals, are described below. Based on each daughter's age, we provide estimates of how much of her inherited load of industrial pollution remains in her body. These remaining, inherited loads of pollution now likely represent just one portion of each daughter's total body burden of industrial chemicals, which for these four women has continued to accumulate over the two to nearly three decades that have passed since their births. 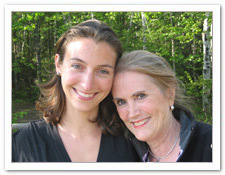 Annette Gellert and her daughter Heather Gellert live in northern California. Annette is a business executive, and Heather, at age 17, is a high school student. 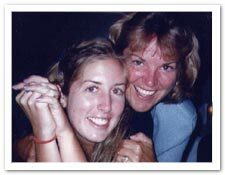 Of the 34 chemicals found in Heather's body, 30 (88 percent) were also found in her mother. According to measurements of chemical persistence in the body, Heather still carries an estimated 27 percent of the Scotgard (PFOS), 7 percent of the Teflon (PFOA), and 62 percent of the lead passed on to her from her mother, across the placenta and through breast milk. Ann Hunter-Welborn, a community activist in Encinitas, California, and her daughter Jessica Welborn, a PhD student from San Francisco, share all but two of the 29 industrial chemicals found in Jessica's blood and urine. Jessica still harbors in her body nearly half of the lead passed on to her from her mother across the placenta and through breast milk, and an estimated 12 percent of the Scotchgard (PFOS) and one percent of the Teflon (PFOA) she inherited from her mother at birth. Martha Davis, an environmental scientist from Denver, Colorado, and her daughter Emily Sayrs, a student, claim the highest shared burden of industrial chemicals of any mother and daughter pair tested. All but one of the 41 chemicals in Emily's blood and urine were also found in her mother. Emily continues to bear an estimated 62, 27, and 7 percent, respectively, of the lead, Scotchgard, and Teflon passed on to her from her mother at birth. Adelaide Gomer is vice president of a charitable foundation in New York, and her daughter Alicia Wittink is a a Washington, D.C.-based consultant. More than 92 percent of the 26 chemicals found in Alicia were also present in her mother. When Alicia gave birth to her daughter in fall 2005, she still carried in her body an estimated 47, 12, and one percent of the lead, Scotchgard, and Teflon she inherited from her mother — through her placenta and breast milk she passed down some of this same pollution to her own daughter.